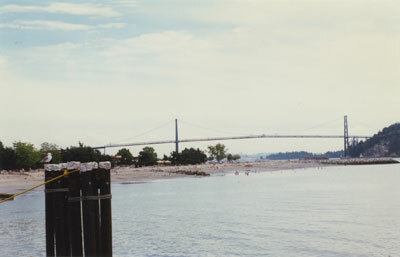 View of Lions Gate Bridge looking east from Ambleside Landing. The image shows Ambleside Beach with people on the beach and in the water. Scanned December 2011 using Epson Perfection V700 Photo at 300dpi and 100% of original image size. Alternate Versions: Lossless TIF from original scan at 300dpi and 100% of original print. W15.5 x H10 cm colour print on photo paper.